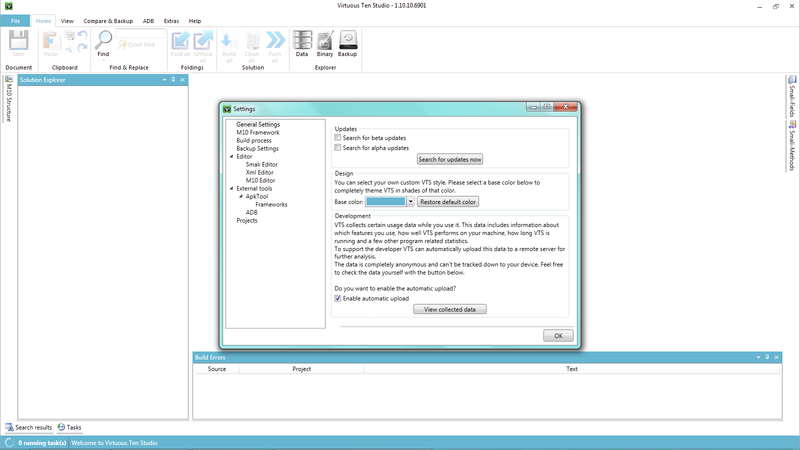 As you can see, VTS is built using the Microsoft-style Ribbon interface. Love it or loathe, it is a very handy interface that groups similar tasks into categories, and in my opinion is a much more accessible way of accessing VTS functions. The various functions are arranged in tabs, and we will take a look at each tab in turn. This is where you can create new projects, open existing ones, change settings, activate license etc. Changelog – as it sounds really! This is where the bulk of the magic happens. 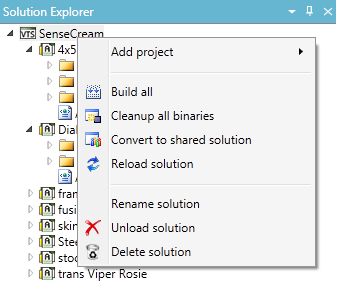 Once you open a solution, it will appear in the Solution Explorer window on the left. 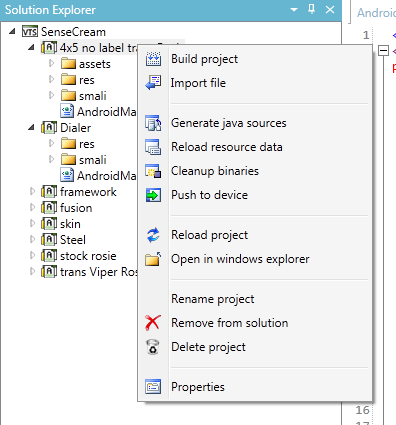 In the file tree, solutions are represented by the small VTS logo (in this example, the solution is called SenseCream). Projects are then branched under that (e.g. Dialer). 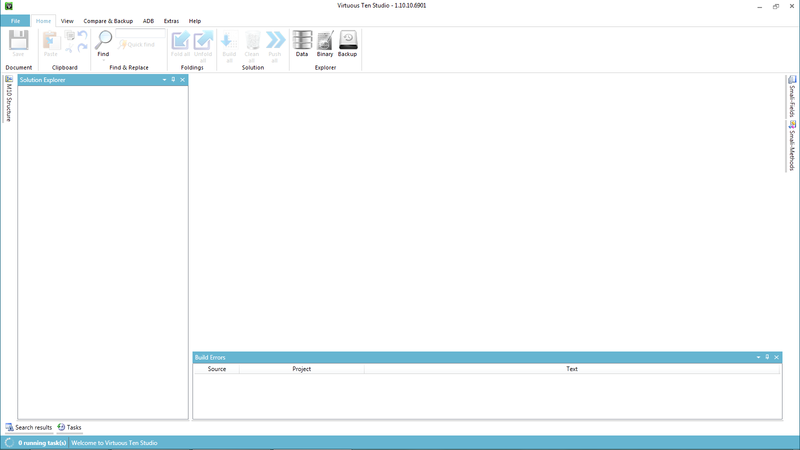 Double clicking on a file will load it up into the main window on the right, where you can view and edit data. 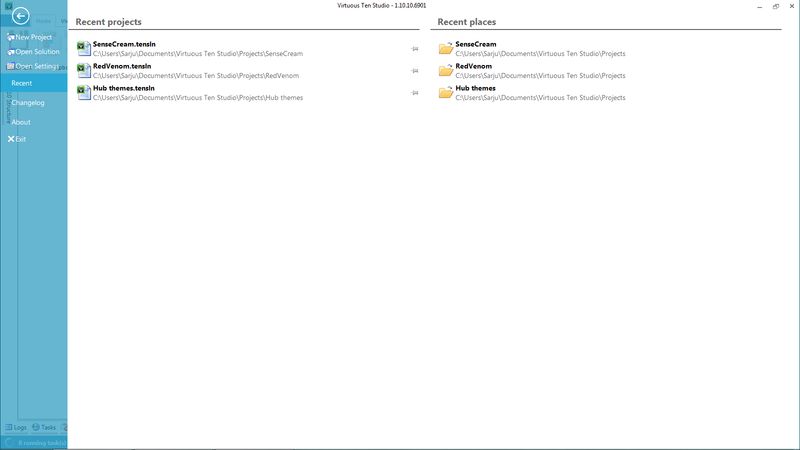 The various file functions are grouped together on the ribbon at the top. Hovering over each button will give you a brief description of what each button does. This tab gives you control about what information is displayed on the window. The first entries are related to log generation. 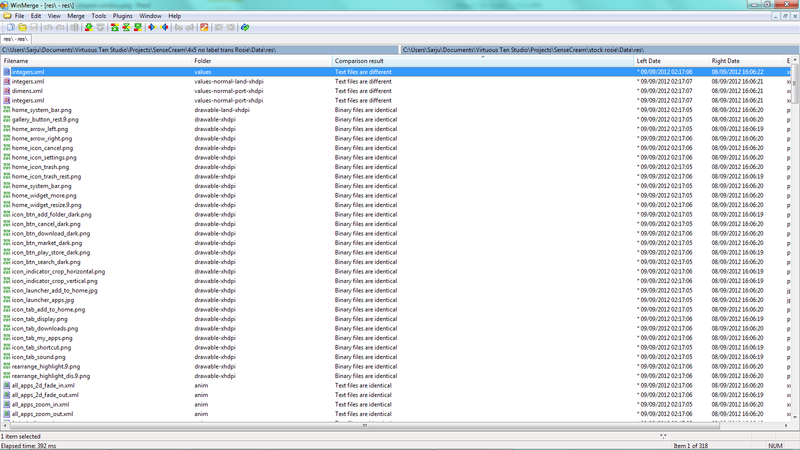 If you click on log viewer, it opens a separate window which can display as much or as little log info as you want. You can use the checkboxes to choose what info is displayed in the log, and the Filter and Tag option let you narrow down the info further. There is no right click menu, but you can use the mouse to highlight and Ctrl-C to copy selected info out of the window. 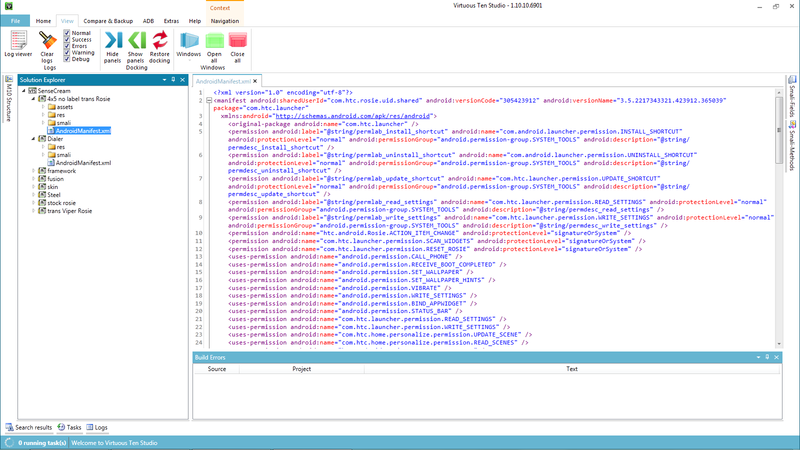 You can also choose to export as a .log file. The next group of buttons control the appearance of panels. 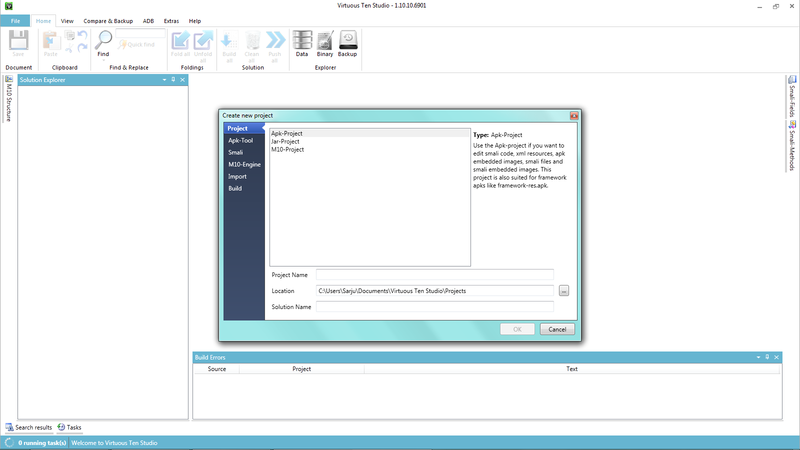 VTS splits different info groups into separate panels. You can see from the following screenshot the sheer wealth of data VTS can display – the good news is this is entirely customisable to your taste! 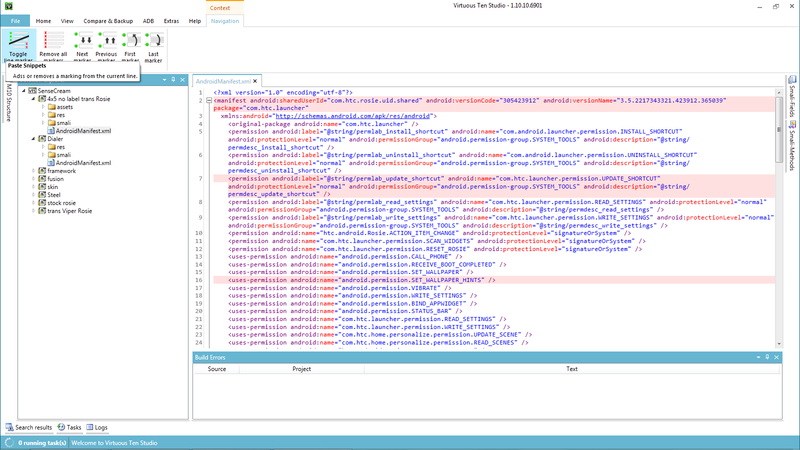 I have got the Solution Explorer and Build Error panels pinned, so they are always expanded. I have set the remaining panels as unpinned and autohide around the edges, so when I click them they pop up, but then disappear when I click elsewhere. Of course you can also rearrange the panels, just click on the header of a panel and drag it to the desired position (make sure the panel is pinned, unpinned panels can’t be moved). If you closed a panel, just re-open it via the “Windows” button in the “View” tab. 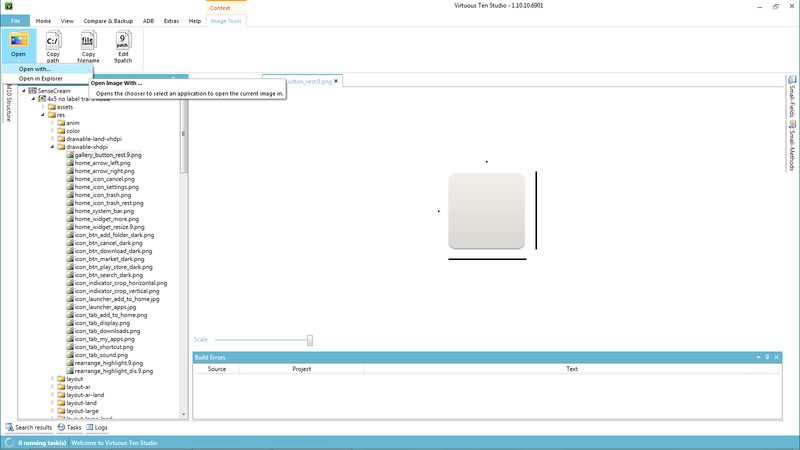 The panel will open as a seperate window, however, you can grad them again to the desire position and dock them to the main window. This is one of the most useful tabs, and arguably one of VTS’s most powerful tools. At some point, everyone using VTS will want to compare two existing apks to see how they differ. 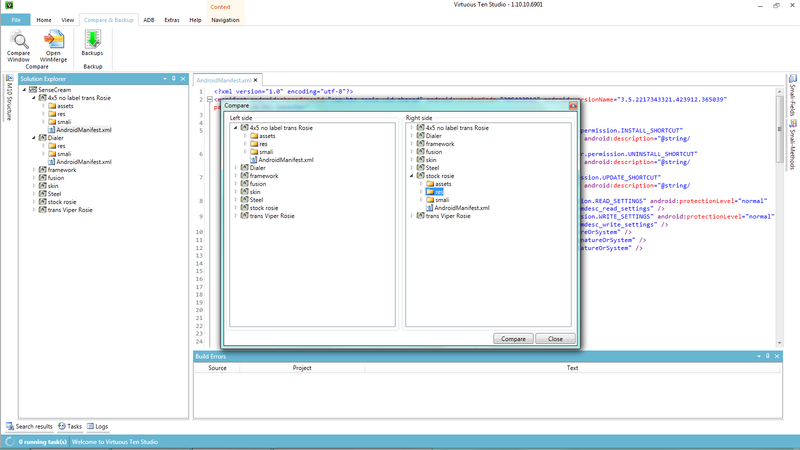 This tab offers 2 different ways to do so, and uses a built in version of Winmerge. Choose which folders/files you’d like to compare and hit the Compare button. A new Winmerge instance will open. You can then compare contents, and work out what has been changed between the two files. If you make any changes in either window, don’t forget to hit the Save button in Winmerge before closing. Also, don’t forget that if you edit an xml within Winmerge, it will save the original as *.xml.bak – you will need to delete that file before attempting to build the apk or you will get compile errors! Say you want to try editing something, but it doesn’t work. 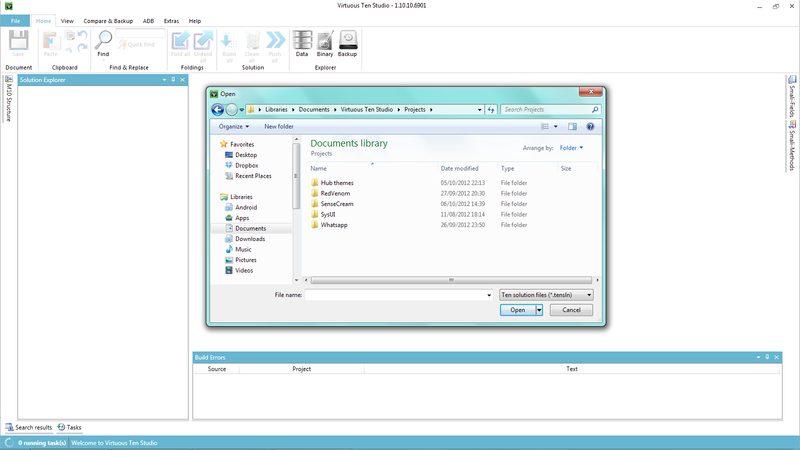 Just open the Backup window, and restore your last backup – nice easy way to revert changes. If your device is connected via ADB, this tab will let you interact with it using the normal ADB commands, including adb push, pull and log. Make sure your ADB connection is properly set up and all neccessary drivers are installed. 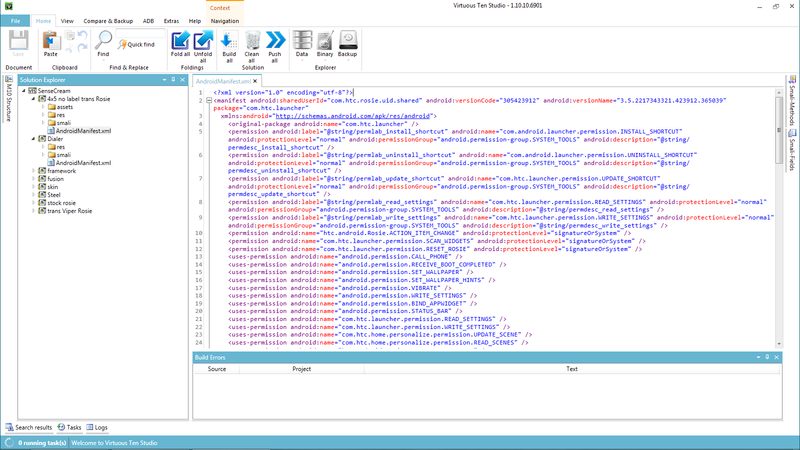 This tab contains some advanced functions for working with m10 and smali files. These will be covered in one of the later tutorials. However, one highlight is the Scale tool, which makes it incredibly easy to convert between different screen resolutions – very useful when trying to port apps between devices! 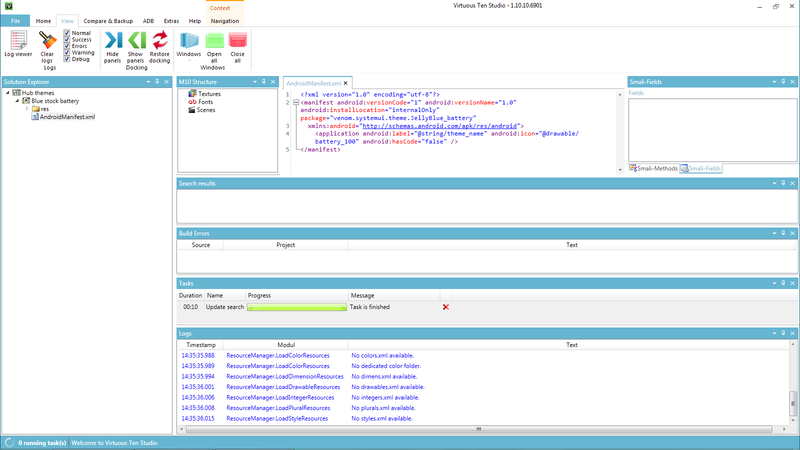 Further sources of info, including the VTS website and more info on APKtool and Smali. This tab has specialised functions, and only appears when needed. 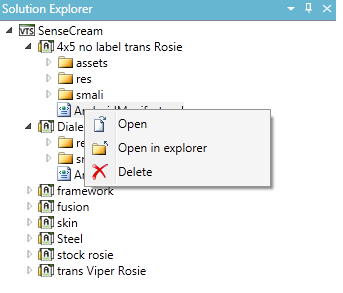 You can open the folder location in an Explorer window, or using any graphics editor of your choice. 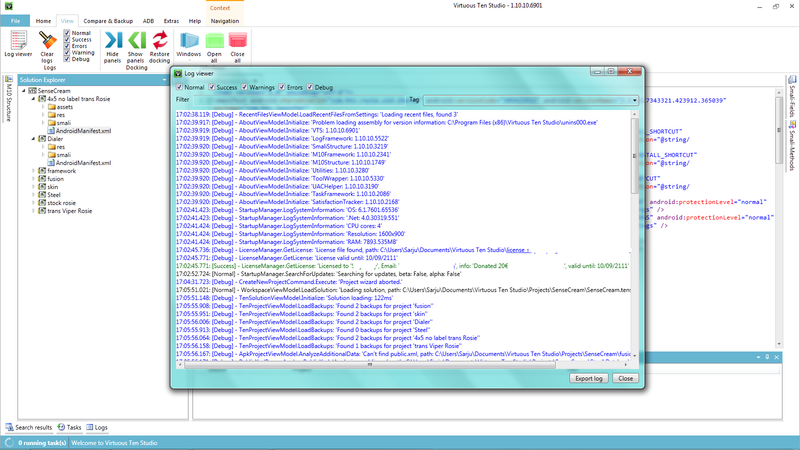 So there you have it, a fairly exhaustive trek through the VTS interface. The info contained above barely scratches the surface of what VTS can do, but hopefully now you’re armed with enough knowledge to go exploring for yourself!